On February 4th, 2019 Betty Jo (Stripling) Baker 85 years young of Oliver Springs, fortified her Diamond status for a jackpot bigger than this worldly life can offer. She was born December 12, 1933 in Oliver Springs, TN, the daughter of Bill and Tina Trosper Stripling. In addition to her parents, she was preceded in death by husband Arvil Lee “Joe” Baker Jr., and sister Peggy Phillips. Betty was a member of Machinist Union Local 480 and retired from Martin Marietta in 1994. 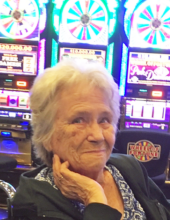 After her retirement she was devoted to the good things of life, Grandkids, Gardening, Quilting and a slot machine… Harrah’s was her past-time where there was nothing better than a hot slot machine (or a cold one) and a bunch of good scratch off’s. A weekly player of Powerball has gained her little other than staying up late on Wednesday and Saturday night, but it was always interesting to her scream out “I hit the Powerball… but I didn’t get the other 5 numbers” which always gave us a chuckle. She is survived by daughters, Delores Bird and Margo Baker of Oliver Springs and Debbie Thomas of Kingston; brother, Charles (Buddy) Stripling of Harriman and grandchildren, Travis Bird of Williamsburg, KY, Aaron Bird (Crystal) of London, KY, Tocha Brandon of Knoxville; step-granddaughter, Kaylie Shannon, of London, Ky, and great-grandchild Jordan Holmes of Knoxville. The family will receive friends on Wednesday, February 6, 2019 from 5 – 7pm at Weatherford Mortuary. The funeral will follow at 7pm with Pastor Gerald Mullins officiating. Family and friends will meet on Thursday at 1pm at the Oliver Springs Cemetery for a graveside service. An online guest book can be signed at www.weatherfordmortuary.com. To send flowers or a remembrance gift to the family of Betty Jo Baker, please visit our Tribute Store. "Email Address" would like to share the life celebration of Betty Jo Baker. Click on the "link" to go to share a favorite memory or leave a condolence message for the family.